Our rubber is harvested in its pure state only 6 months per year as trees can't be cut during the summer & rainy season. From its pure state, we use the dunlop process when frothing the rubber which is more involved, but produces a much higher quality and consistent, rubber as the weaker air bubbles are removed. We don't add "fillers" such as clay to make the rubber go further. Instead, our rubber is handcrafted using specialized molds and highly sophisticated processing techniques to get just the right softness, consistency and density. 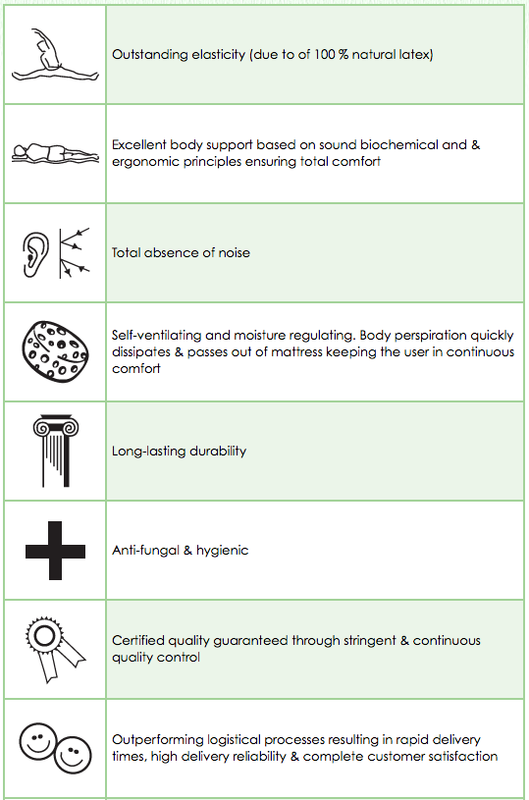 All of our natural rubber mattresses and overlays are free from chemical dyes, pesticides, bleach, carcinogenic adhesives and chemical flame retardants. As a result, you receive an organically pure natural rubber that is softer, more elastic, optimized for relieving pressure points and providing unsurpassed comfort and support, while at the same time absorbing the shock of body movement. We use only Authentic Natural rubber (100% Polymer) with no petroleum chemical, synthetic fillers, ash or chalk in our production. We comply and manufacture within standards approved by independent institutes for your confidence and comfort.